The annual Spirit Tree competition for Homecoming was held on Monday afternoon, pitting student organizations against each other to decorate the tree and to show their school spirit. The organizations crafted an ornament representing themselves and adorned it on the lone Valencia orange tree on campus. They also performed short comedic skits that mocked the University of Miami’s upcoming opponents in the Homecoming game, the Virginia Cavaliers, as well as interpretative dances and speeches on why it’s great to be a Miami Hurricane. The event was held at the small tree between the Bowman Foster Ashe Administration Building and the Oscar E. Dooley Memorial Building. Points will be allocated by judges of the competition and announced on Thursday during the alma mater finals at the Rock. 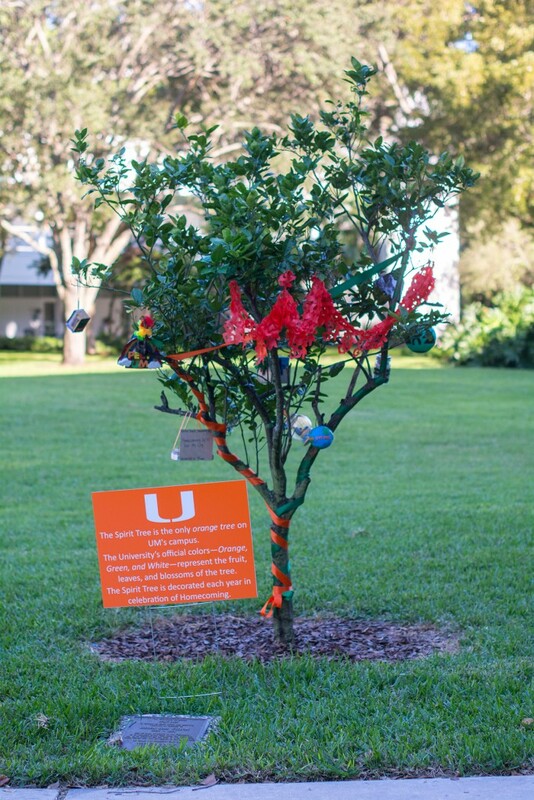 United Black Students (UBS) created an ornament that represented Virginia Key Beach due to its history as the only beach in Miami that black people were allowed to go to. They used blue sequins for the water, sand stuck to a styrofoam base and sticks to create beach chairs and a pier. To top it off, a lavender stick was used as a sign on the beach, scenting the ornament. Federación de Estudiantes Cubanos (FEC) President Daniela Lorenzo performed a poem that represented the organization’s UM pride, and FEC member Sarah Betancourt performed an interpretive dance. “It doesn’t matter the color of your skin, Miami students greet each other with a grin, especially after a Miami win,” Lorenzo said in her poem. The event honors the only orange tree located on campus, which represents the colors of the university. The tree’s history dates back to 1991 when it was planted by William R. Butler, former university vice president and founder of the Butler Center for Volunteer Service & Leadership Development, after students prodded him about the lack of orange trees on campus. The judges will base their scores on the skit’s performance and inclusion of the Homecoming theme, its relevance to the organization presenting it, the visual appeal of the ornament and how well it hung on the spirit tree. The judges are Matt Barnes, assistant director of commuter student involvement, Sendi Colquitt, assistant director of Student Activities and Student Organizations (SASO) and Gail Cole-Avent, executive director for student life and assessment. Correction: This article originally stated that Sarah Betancourt is the President of FEC.